Modify your communication strategy to reflect transformations in customer behavior. By proactively engaging with customers over mobile channels, your business can improve your ability to reach customers and increase important metrics like contact and response rates, revenue, customer loyalty, and satisfaction. 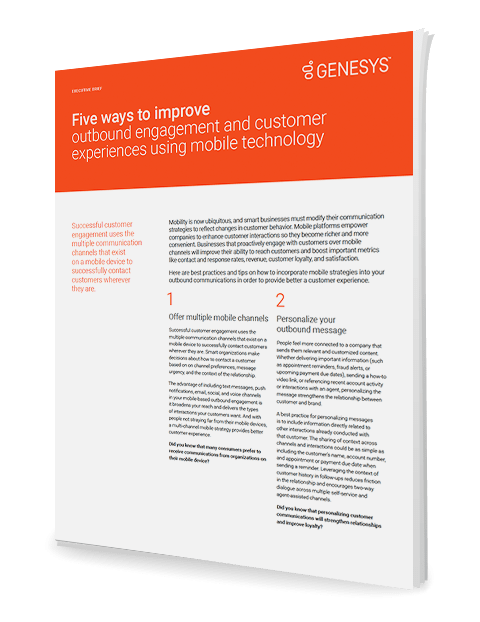 Download this Genesys executive brief to learn how to incorporate mobile strategies into your outbound communications in order to provide better customer experience. GET THE EXECUTIVE BRIEF TODAY!